The external forces on fjord landsystems described above tend to act over periods of several thousand to tens of thousands of years, but they remain significant when trying to understand the system over full glacial periods. Over the shorter term, local processes are the significant factors in generating a fjord landsystem record. Here we will discuss the major processes that go to producing different depositional systems, geomorphological units and allostratigraphic units within fjords, and describe each of the systems, their geometry and make-up relative to these processes. We will also deal with different climatic regimes in which fjords occur and compare and contrast their systems. First, however, we need to briefly mention erosion, as fjord systems are at least initially erosional at the large scale of the trough itself, commonly being formed by a combination of glacial, mass wasting and fluvial erosional processes. Figure 13.4 Model illustrating the relationship between sliding velocity (SV and small arrows at the base of the windward glacier) and the equilibrium line altitude (ELA) across an orogenic belt. An orographically induced rise in the ELA from the windward to the leeward side of the range leads to a higher mean ELA (solid black line). Smaller amplitude fluctuations in the ELA between glacial (dashed line) and interglacial (grey line) is shown schematically (the leeward range is ~33% of the windward range). Assuming bedrock erosion rate scales with basal sliding velocity, the model suggests concentration of erosion in a topographic band whose height is dictated by glacial/interglacial altitude limits to the ELA and whose width is a function of the concomitant glacial expansion/retraction in the landscape. The windward band width and height are likely to be greater than those of the leeward flank. Note that the range crest is defined by a topographic peak that corresponds spatially with a zone of low erosion rate by glaciers emphasized by the vertical downward arrow. (After Meigs and Sauber, 2000). modulate the locus of uplift, at least in southern Alaska. They argue that positive feedback between erosion and uplift is manifest in the local topography where mean elevation reaches a maximum within the area where they infer high values of uplift and exhumation rates. During glacial maxima, fjords are dominantly under erosional or non-depositional regimes, and sediment deposited during the glacial advance through the fjord as well as any deposits from previous cycles may be eroded out, perhaps down to bedrock (e.g. Andrews, 1987, 1990; Boulton, 1990; Powell, 1991). The degree of erosion, however, may depend on the glacial regime; sediment appears to be preserved from several glacial episodes in sub-polar (Andrews et al., 1987, 1990) and polar fjords (e.g. McKelvey, 1981; Powell, 1981b; Barrett and Hambrey, 1992). When glaciers do erode almost all previously deposited sediment down to bedrock, large volumes of that sediment may be excavated. For example, in Glacier Bay, Alaska, much of the fjord system appears to have been filled with sediment, including outwash with buried trees and lacustrine deposits, up to about 200 m above present sea level after retreat from the Last Glacial Maximum (McKenzie and Goldthwait, 1971; Goodwin, 1988). During an advance of over 70 km during the Little Ice Age all of that sediment was eroded out down to bedrock which locally is over 300 m below sea level (Seramur et al., 1997). The volume of sediment removed would probably have been in excess of about 1010 m3 over approximately 850 years. The best ways to investigate subglacial systems of fjords is to look at overturned icebergs, interpret seismic reflection profiles, use ice radar to investigate bed characteristics, use submersible remotely operated vehicles to investigate the margins of glaciers where they end on the sea floor and also newly exposed sea floor from glacial retreat, and to study raised Quaternary deposits. Each method has its problems in terms of inferring former processes, but, although the glacier bed is below sea level in most areas of a fjord, processes and resulting sediments appear to be the same as for terrestrial glaciers (e.g. Glasser and Hambrey, 2001a). Subglacial till deformation occurs as inferred from overturned icebergs in temperate systems (cf. Powell and Molnia, 1989; Fig. 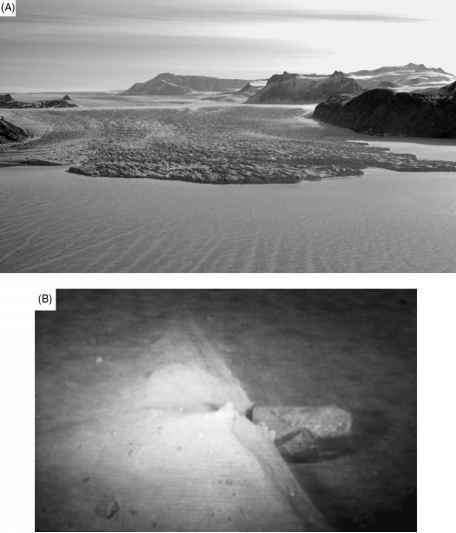 13.5) and from overturned icebergs (Glasser and Hambrey, 2001b) and terrestrially exposed deposits (Boulton et al., 1999; Bennett et al., 1996c) in subpolar systems, and patterned ground, cored sediment strength (Solheim, 1991) and fluted till on recently exposed sea floor (Fig. 13.6; Powell et al., 1996) in polar systems. Lodgement of till is also inferred to occur. However, subglacial melt-out must be rare because marine-ending glaciers rarely stagnate (Powell, 1984). Furthermore, the common terrestrial sequence of subglacial to englacial and/or supraglacial till facies does not occur for the same reason, and subglacial deposits are overlain by marine sediment. The till occurs in sheet or quasi-sheet geometries but its distribution appears to vary from temperate systems where it is patchy (Cai et al., 1997) to being more continuous and extensive for sub-polar and polar systems (Elverhei et al., 1980, 1983; Powell et al., 1996; Anderson, 1999; Domack et al., 1999; Shipp et al., 1999). These different styles of till distribution may well be a factor of subglacial water conditions in terms of volume and flow geometries. In glacial systems of temperate fjords conduit flow becomes well established during a melt season, and even though flow appears to decrease or stop during winters (Cowan and Powell, 1991a and b) it is commonly reestablished in the same location the following season (Powell, 1990). This is not inconsistent with models which indicate that deforming till and low-pressure channels can co-exist (Alley, 1992), and perhaps the channels are not fully closed by ice or till deformation during winter as a result of being flushed with sea water. Whether marine-ending glaciers have similar debris-incorporation processes to the supercooling freeze-on of terrestrial glaciers (Lawson et al., 1998; Alley et al., 1998) is uncertain; however, the required overdeepened bed geometry is present in fjords and is a possible factor to consider in discharges at marine glacial termini (Powell, 1990; Dowdeswell et al., 2001). In these overdeepened scenarios, a stream is unlikely to be sufficiently competent to transport coarse bedload up the back slope of the grounding-line fan that it's building. This forces coarse sediment under the glacier and on the up-glacier side of the fan. 4. a group of processes that commonly produce lesser sediment, depending on glacial regime, including: lodgement of till on the stoss side of the grounding-line system; iceberg rafting both by dumping of supraglacial debris as ice is calved and as icebergs roll, and from rain-out by sea water gradually melting an iceberg; melting of glacial ice to produce grain- and rockfall from a grounded tidewater cliff; rain-out from the base of a floating glacier-tongue from undermelting by sea water; and squeezing of subglacial sediment out beyond the grounding line. Figure 13.5 A) A submarine iceberg rising to sea level after calving from the basal ice area of a glacier in Alaska. B) After these bergs stabilize they provide a window of the basal debris stratigraphy of the glacier, including basal till and subglacial till. These may be sampled as is shown in (C) where subglacial till lies above basal till that is barely 1 per cent ice; the stratigraphy is inverted because the berg has rolled over to expose this basal section. (Photos A and B are from Powell and Molnia, 1989). A unique process occurs at a grounding line when icebergs calve from the base of the glacier or when a floating glacier tongue lifts off its bed. Subglacial till is frozen onto what was the sole of the glacier and is carried with the ice into the water column. As this till drops to the sea floor it produces till clasts of varying sizes in an area near the grounding line before the till block is completely melted from the old basal ice. These till clasts help define grounding-line systems in combination with their distinctive facies associations and architecture. 4. active glaciers pushing sediment piled against a cliff. Grounding-line deposits have been given various names in the literature but in general they have been divided into grounding-line wedges, morainal banks and grounding-line fans based upon their geometries (Powell and Domack, 1995; Powell and Alley, 1997). Their geometries primarily depend on the dominant processes by which they are made, but the terminus type at the grounding line is also important. A tidewater cliff places no restriction on sediment accommodation space and sediment may aggrade to sea level, whereas a floating glacier tongue constrains the vertical aggradation of grounding-line systems. As grounding-line systems grow under floating tongues they may actually create an advance of the grounding line because sediment comes in contact with the glacier sole, where it is likely to be deformed and sheared flat from glacier flow. Formational processes of the main geometrical groups of grounding-line systems are thought to be as follows. Figure 13.6 A) Aerial view of Mackay Glacier, an outlet glacier of the East Antarctic Ice Sheet in southern Victoria Land that ends in Granite Harbour along the coast of the Ross Sea at 77°S. The last 4 km of the glacier is a floating glacier tongue. 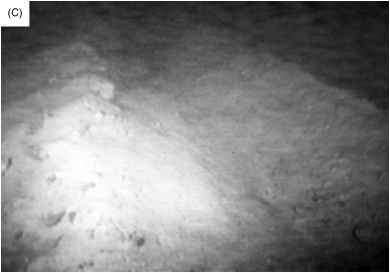 B) and C) Flutes in subglacial till, observed using a submersible remotely operated vehicle, exposed on the sea floor following recent grounding-line retreat. C) A boulder has dropped from the floating glacier tongue above this site (B) and bergstone diamicton drapes flutes that have been exposed longer on the sea floor. (Photos (B) and (C) are after Powell et al, 1996). 1. A line source along a grounding line being fed by a deforming till bed which, may accumulate up-glacier as a sheet, but when released from its subglacial position, moves away from the grounding line as diamictic debris flows to produce wedge geometries. The resulting debrites thin distally to form the wedge geometry and some may be tens of kilometres long (e.g. King et al., 1991; Laberg and Vorren, 1995; Dowdeswell et al., 1996, 1998; Mohrig et al., 1999). 2. Morainal banks are also produced from line sources but as opposed to wedges, they are composed of a mixture of sediment originating from the wide range of glacial debris-supply processes described above. They also have the competency and accommodation space to stand in bank form (Fig. 13.7) and some are hundreds of metres high (e.g. Stravers and Syvitski, 1991). Sediment is redistributed from these banks as slides and slumps, debris flows and turbidity currents (e.g. Powell, 1981a, 1983; Syvitski and Hein, 1991; Syvitski, 1993; Syvitski and Shaw, 1995; Dowdeswell et al., 1996, 1998; Cai et al., 1997), and some may be steep enough for grain flows. Some evidence indicates that as glaciers surge into the sea, they form morainal banks with large debrites in the forebank areas (cf. 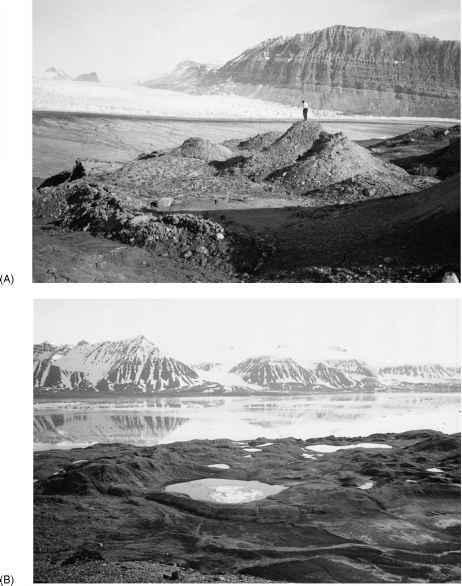 Solheim, 1991; Boulton et al., 1999), which may be useful for characterising these types of fjord glaciers. Figure 13.7 Major process components that contribute sediment to a morainal bank. Geometry of the banks varies depending on the end-member process and respective terminology used in the literature is presented with each one. Other terms used for morainal banks in the literature are also shown in parentheses under the term. The morainal bank is the preferred term here because it distinguished the deposits from moraines which are formed subaerially, and 'bank' is a standard allostratigraphic and maritime term used for such geometric bodies. (After Powell and Domack, 1995). produce continuous underflows down the fan (Powell, 1990) in a similar way to those found in other environments (Mulder and Syvitski, 1995; Mulder et al., 1998; Kassem and Imran, 2001). More commonly, rapid sedimentation at that site produces turbidity currents by repeated failing of sediment as it accumulates rapidly with a high water content in the zone where the jet detaches from the fan and rises through the water column. Often sediment within the turbid overflow plume is released episodically as the hypopycnal flow interacts with changes in tidal current velocities. That interaction produces deep-water tidalites via hemipelagic suspension settling processes. Laminae are produced in couplets of sand and mud proximal to the efflux (within about 1 km), and silt and mud distally in a radial sense, out to about 15 km from the efflux (Fig. 13.8). These facies have been termed cyclopsams and cyclopels, respectively (Mackiewicz et al., 1984; Cowan and Powell, 1991a; Cowan et al., 1998, 1999; cf. O Cofaigh and Dowdeswell, 2001). Local failures also may occur to redeposit sediment by mass flows within the fan complex. Grounding-line systems in modern and Quaternary temperate settings are quite well documented and include a combination of morainal bank and grounding-line fan forms. Although less well known, sub-polar systems appear to be similar to temperate systems. Grounding-line systems in polar fjords are not well studied. We presume they are similar to those on continental shelves where they are dominantly grounding-line wedges (cf. 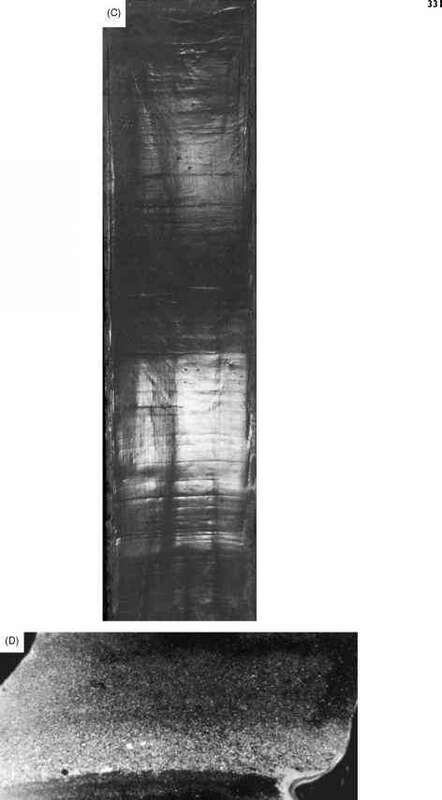 King et al., 1991; Anderson, 1999; Shipp et al., 1999) with little subglacial conduit water flow. However, in fjords, glaciers may have more channelized subglacial water flow if the glaciers are thick enough for pressure melting at the bed. The grounding line of one polar outlet glacier has actually been observed by using a submersible, remotely operated vehicle. There, subglacial sediment was deforming and no channelized water flow was observed (Fig. 13.9). Grounding-line sediment was diamict occurring either as a wedge, or locally where basal crevasses at the grounding line allowed sufficient accommodation space, as a bank (Powell et al., 1996). Beyond the grounding line, shelfstone diamicton (sensu Powell, 1984) was being formed by rain-out of basal debris from the sole of the tongue as it moved away from the grounding line. Under conditions close to being true polar in Antarctic Peninsula fjords, tongues of cold water have been documented extending away from glaciers. 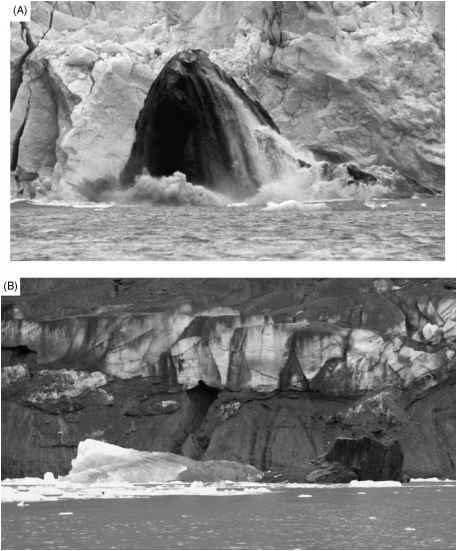 They are interpreted as originating from melting/freezing processes under floating or partially floating glacier tongues (Domack and Ishman, 1993; Ashley and Smith, 2000) and are discussed further below (see Iceberg Zone Systems). Facies models based upon these processes have been verified and elaborated by detailed analyses of older uplifted Quaternary examples (e.g. Retelle and Bither, 1989; Stewart, 1991; McCabe and O Cofaigh, 1995; Lonne 1995, 2001; Lonne and Lauritsen, 1996; Hunter et al., 1996b; Plink-Bjorklund and Ronnert, 1999) and high-resolution seismic reflection profiles (e.g. Elverhoi et al., 1983; Gilbert, 1984; Belknap and Shipp, 1991; Stravers and Syvitski, 1991; Sexton et al., 1992; Cai et al., 1997; Lonne and Syvitski, 1997; Seramur et al., 1997) from various locations. 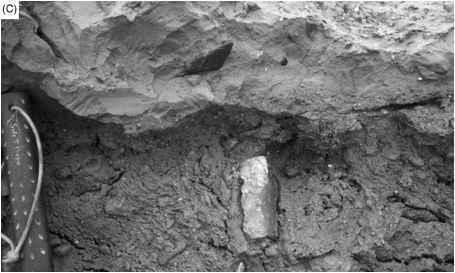 The advantage of using Quaternary deposits is that they allow a full documentation of lithofacies that in modern settings are depicted primarily as seismic facies with small local samples from sediment cores. In combination with seismic reflection profiles of fjord bottom sediment, they also allow verification of lateral facies changes and geometries, of large-scale deformation structures and of detailed facies successions, particularly in coarser-grained deposits which are difficult to sample in modern environments. In general, the facies and geometries of Quaternary examples are the same as those of modern settings, but details of some facies and the complexities of interfacies geometries are better defined (Fig. 13.10). For example, small- and large-scale deformation structures associated with grounding-line oscillations and glacial over-riding are better defined (e.g. McCabe et al., 1984; McCabe, 1986; Lonne, 1995, 2001; Hunter et al., 1996b; Lonne and Lauritsen, 1996; Lenne and Syvitski, 1997; Bennett et al., 1999; Boulton et al., 1999; Plink-Bjorklund and Ronnert, 1999). Varieties of gravel and rubble facies associated with grounding-line systems, particularly grounding-line fans, are well documented (e.g. Powell, 1990; Plink-Bjorklund and Ronnert, 1999), as are structures generated by iceberg rafting (cf. Thomas and Connell, 1985). 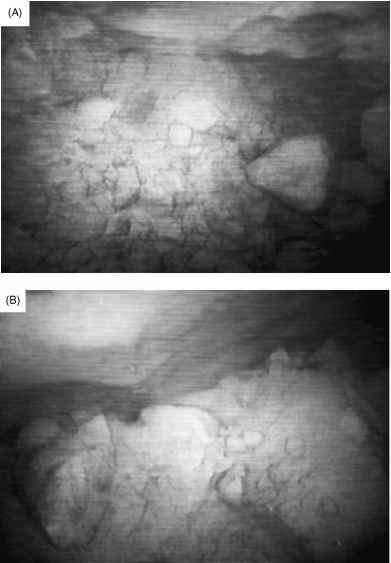 Figure 13.8 Laminites of cyclopels and cyclopsams deposited by suspension settling from turbid meltwater overflow plumes, Muir Inlet, southeast Alaska. A) A 7.5 cm wide core of ice-proximal laminites of cyclopsam sands and local turbidites with B) associated photomicrograph (~40 mm across) of a cyclopsam. C) A 7.5 cm wide core of more distal laminites of cyclopel silt laminae in suspension muds, with D) an associated photomicrograph (~ 100 mm across) of a cyclopel. (After Mackiewicz et al., 1984). Figure 13.9 Mackay Glacier (see Fig. 13.6) grounding-line sediments that vary in texture and the degree of consolidation within tens of metres along the grounding line. Here stiff clast-rich till (a) contrasts with weak muddy till (b). (Photos after Powell et al., 1996). be sediment-starved and thus is represented by a depo-system that is a condensed section. As opposed to ice shelves where the distance between the grounding and calving lines may be hundreds of kilometres, distances here may be short enough that continental shelf waters rich in nutrients can circulate under the tongue. This circulation can bring in phytoplankton such as diatoms to produce a fossil record as well as providing a food source for quite diverse epibenthic and shallow infaunal communities. Figure 13.10 Conceptual model for the development of a grounding-line fan (schematic, not to scale). A) The basic depositional architecture comprises four allostratigraphic units, whose boundaries are erosional discontinuities ranging from discordant (thick wavy lines) to concordant (thick smooth lines); the arrows indicate dominant transport directions, and glacial tectonic deformation. Letter designations with sub-numerals indicate relative timing and location of each unit and their associations. Small-scale syn-sedimentary glacial tectonic deformation may be included in units (A) and (B). B) More compressive deformation, suggesting a pronounced glacier advance, is distinguished as 'Ad' (A-deformed). (After L0nne, 1995). Which source(s) dominates is primarily a function of climatic regime. For example, under polar conditions sea ice, aeolian and biogenic components are important, icebergs and hemipelagic mud sedimentation are significant in sub-polar regimes, and hemipelagic mud sedimentation and turbidity currents dominate all others in temperate systems. The periodicity of changes is also mainly climatically controlled (e.g. millennial periodicity or Milankovitch forcing; sub-millennial to decadal periodicity like the El Niño Southern Oscillation and Pacific Decadal Oscillation; annual periodicity (varves) and sub-annual periodicity (cyclopels)). Icebergs impart their character to the sediment record primarily by rafting glacial debris. Because this debris ultimately becomes incorporated in fjord floor sediment, the deposits are termed genetically either bergstone muds or bergstone diamictons (Powell, 1984). Icebergs introduce their glacial debris load into the sea by rolling and dumping surface ablation debris and by progressive melt-out below the water line of individual englacial particles, a process termed 'rain-out'. It is important to remember that iceberg-rafted debris includes all particle sizes, thus, depending on iceberg concentration and the relative contribution of hemipelagic mud, sediments of a gravelly mud or a diamict texture are produced. Based upon these depositional processes iceberg zone systems are basin fill, sheet and sheet-draped deposits. 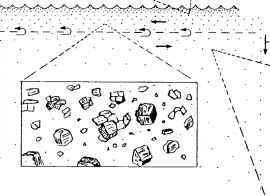 Iceberg-rafted debris produces lonestones from sand- and gravel-sized particles, and if they show evidence of having been dropped (e.g. Thomas and Connell, 1985) they may be termed 'dropstones'. Even with a lack of dropstone evidence it is still possible to decide lonestones have been rafted due to their out-sized character; that is, clasts could not have been hydrodynamically transported with their surrounding matrix based either upon particle-size distribution or thickness of stratification relative to clast size. However, care must be taken that this rafted sediment indeed originates from icebergs because other agents can raft sediment such as sea ice, plant roots and mammal gizzards (e.g. Gilbert, 1990b; Bennett et al., 1996). Other features indicative of iceberg rafting are till pellets and clast nests, the latter being indicative of iceberg dumping and may serve as an indicator of an iceberg zone rather than a floating glacier-tongue system (cf. Powell, 1984). When icebergs are large they have large drafts and their keels can scour the fjord. As they do so they leave iceberg furrows (e.g. 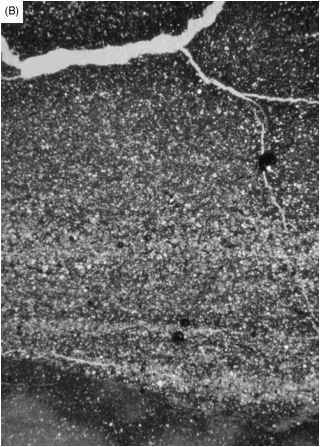 Syvitski et al, 1983, 1996; Woodworth-Lynas and Guigné, 1990; Dowdeswell et al, 1993) on the sediment surface (Fig. 13.11) and internally turbate the sediment in a process termed 'ice keel turbation' (Vorren et al., 1983; Barnes and Lien, 1988). In fjords these processes most commonly occur along fjord walls and on fjord shoals where water depths are shallow, but in polar settings where icebergs are large they may be trapped behind sills and actively scour deeper basin sediment (e.g. Dowdeswell et al., 1993). In temperate and sub-polar settings such as Alaska and Norway (Powell, 1990; Cowan and Powell, 1991a and b; Plassen and Vorren, 2002; Vorren and Plassen, 2002). Baffin Island (Gilbert, 1982; Gilbert et al., 1990; Syvitski and Hein, 1991; Winters and Syvitski, 1992) and west Spitsbergen (Elverhoi et al., 1980, 1983; Gorlich, 1986; Sexton et al., 1992; Svendsen et al, 2002), hemipelagic mud sedimentation occurs from baroclinic overflows that are turbid and charged with glacial rock flour from stream discharges at grounding-line fans and deltas. Sedimentation rates are lower than in the grounding-line system, being several centimetres per year in temperate systems and a factor or two lower in sub-polar systems. Instead of a logarithmic decay down-fjord as described above for more proximal locations, rates now decrease exponentially. Tides interact with the stream discharges to form deep-water tidalites termed 'cyclopels'. Commonly cyclopels are intimately inter-stratified with turbidites. If sedimentation rates are high enough this stratification is retained due to a lack of in-fauna and consequent absence of bioturbation. More distally (e.g. Figure 13.11 The corner of an iceberg calved from the edge of Mackay Glacier Tongue (see Fig. 13.6) that has impacted the sea floor and disturbed the epibenthic community: (A) after a berg detaches from the glacier tongue it rotates to its own centre of buoyancy, which may mean it impacts the sea floor causing iceberg wallows and scours, and turbating the sediment (B) as it is moved by wind and oceanic currents. ~15 km from a glacier terminus), where cyclopels are not formed because particle size variations in the plumes are minor, the mud may accumulate without internal structure and have a massive appearance even with an absence of bioturbation. This characteristic is probably due to processes of particle aggregation in the water column by agglomeration, flocculation and pelletization (e.g. Syvitski, 1980; Domack et al, 1994; Hill et al., 1998; Fig. 13.12). Mud may also accumulate like this in winter when stream discharges are low or absent. Figure 13.12 Schematic of the change in microtexture of suspended sediment particles as they settle through the fjord water column. Initially the particles are as non-flocculated single particles in the surface freshwater. As they move through the brackish layer they begin to flocculate, only to be consumed by zooplankton in marine waters. With the growth of organic matter, deep water flocs are large and three dimensional. (After Syvitski et al., 1987). 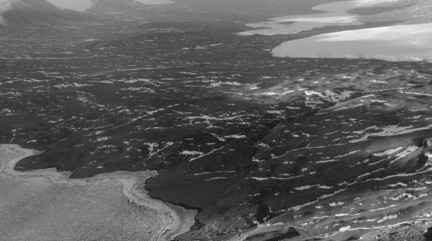 to polar settings in Greenland, the dominant texture of iceberg zone sediment is diamicton beyond the limits of the turbid overflow plumes (Dowdeswell et al., 1994), whereas closer to the glacier laminated bergstone muds accumulate similar to those in temperate systems (O Cofaigh et al., 2001) although, that may vary among fjords too (Stein et al., 1993; Syvitski et al., 1996; Smith and Andrews, 2000). These facies are also influenced by permanent and annual sea ice, which traps icebergs in a formation termed 'sikussak', and inhibits their ability to widely disperse their debris; iceberg rafting is then concentrated to perhaps almost double sediment accumulation rates (Syvitski et al., 1996). The distal diamicton facies in sub-polar settings differs from temperate conditions because no icebergs raft sediment the equivalent distance, as they are smaller and melt faster with a result that only mud accumulates. Small brash ice is the exception because it melts relatively fast in all regimes (cf. Smith and Ashley, 1996). In polar settings siliciclastic sediment flux from subglacial streams appears to be minimal with a consequent very low sedimentation rate of 15 mm/a in polar/sub-polar conditions to 1 mm/a in true polar settings (Griffith and Anderson, 1989; Domack and Williams, 1990; Domack, 1990; Lemmen, 1990; Gilbert et al., 1990b, 1993, 1998; Domack et al., 1993b; Andrews et al., 1994; Domack and Ishman, 1993; Domack and McClennen, 1996; Shevenelle et al., 1996; Ashley and Smith, 2000). Tongues of cold water occur within the water column of some fjords (e.g. Domack and Ishman, 1993), although they are not found in all (Azetsu-Scott and Tan, 1994; Azetsu-Scott and Syvitski, 1999). The cold tongues carry fine-grained suspended sediment in very low concentrations and are thought to originate from a glacier melting directly in sea water (Fig. 13.1). The meltwater mixes with the ambient sea water and, enhanced by tidal currents, the mixed water then flows down-fjord as interflows. The depth of each interflow is controlled by its density resulting from a combination of its salinity, temperature and sediment concentration. Turbidites and debrites originating from grounding-line systems are common facies of the iceberg zone nearest a glacier (see Grounding-Line Systems above). Mostly the turbidity currents and debris flows appear to be unconfined because no sea floor channels occur on most fjord floors although some incipient channels have been described (Cai et al., 1997). It appears that slopes where they are initiated are not sufficiently steep to generate flows of erosive velocities, but the required steepness is reached by the time sediment has accumulated to, or near to, sea level (Carlson et al., 1989). These deposits go to make up a significant portion of the fjord basin fills within the first 10-20 km proximal to grounding lines (Powell, 1991). Other processes in iceberg zone systems include aeolian, sea ice and biogenic activity, which have their action recorded primarily in polar and some sub-polar settings. Aeolian sediment primarily originates from outwash plains, although some may be from bare fjord walls or supraglacial debris. These sources are available in the full range of climates, although they are active over longer periods of time in polar settings where even after deglaciation, exposed areas are poorly, if ever, vegetated. In regimes other than polar, the aeolian contribution to the depositional landsystems is relatively diluted by sediment originating from other sources. In polar regimes however, aeolian sediment may comprise a significant part of the siliciclastic sediment in a fjord because other processes provide such small volumes of sediment (e.g. Barrett et al., 1983; Gilbert, 1984, 1990b; Dunbar et al., 1989). 5. anchor ice attaching to sea floor material and eventually rising buoyantly to become frozen-in to the base of the sea ice floating above. Sea ice may erode in shallow water environments, particularly when it is blown by wind into pressure ridges, the keels of which can reach several metres depth to cause scour and turbation (Hansom, 1983; Reimnitz et al., 1984; Dionne, 1985). Sea ice can also influence the sedimentary record indirectly by controlling the movement of icebergs as described above for Greenland (e.g. Dowdeswell et al., 1994; Syvitski et al., 1996; Smith and Andrews, 2000; Ó Cofaigh et al., 2001). Biological activity and processes in fjords are primarily a function of temperature, salinity, turbidity, and the presence of ice. In temperate settings turbidity appears to be the dominant control particularly near glacial and riverine inputs. In sub-polar settings salinity and temperature can play a more significant role, but turbidity near high sediment fluxes from land can be locally significant. In polar conditions and in some sub-polar settings, sea ice plays a significant role in biological productivity as well as the abundance of different types of organisms. Floating glacier tongues are the most extreme form of ice influence where biological activity relies on ocean circulation to carry organisms under the thick floating ice to provide a biological record in themselves as well as being the food source for others living under the ice. In addition, preservation in the sediment record is also a function of silica and carbonate solubility and of subsequent erosional processes from glacial readvances, icebergs and sea ice turbation and from isostatic uplift resulting in wave or subaerial erosion. Although only a few areas have been thoroughly studied (one of the more thorough overviews is from Kongsfjorden, Spitsbergen (Hop et al., 2002)), records of microflora appear to be dominated by diatoms in the polar regions where they play an important role in biostratigraphic and palaeo-climatic research (e.g. Dunbar et al., 1989; Leventer et al., 1993). In subpolar and temperate settings Foraminifera become important beyond high siliciclastic sediment fluxes (e.g. Armentrout, 1980; Echols and Armentrout, 1980; Lagoe, 1980; Quinterno et al., 1980; Schafer and Cole, 1986; Eyles et al., 1991; Domack and Ishman, 1993; Jennings and Helgadottir, 1996). An important function of planktonic microfauna is in producing faecal pellets and enhancing the sedimentation rates of mud (Syvitski, 1980). 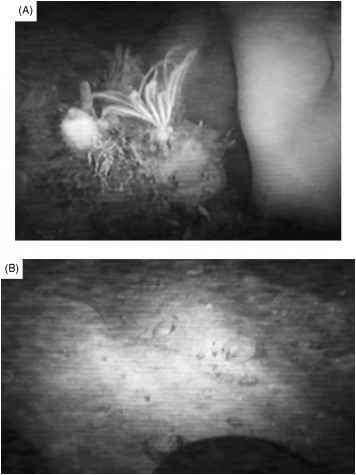 Macrofauna and -flora can become established away from turbidity and high sediment accumulation rates, and in areas of sufficient productivity in the water column. Motile forms may occur in some turbid locations and soup-ground areas, or in areas of low water-column productivity (e.g. Syvitski et al., 1989; Aitken and Bell, 1997; Dawber and Powell, 1998). Epibenthic communities dominate hard grounds, which are commonly bedrock walls or gravel lags such as relict morainal banks or consolidated till, whereas in-faunal communities are common in soft grounds (Plafker and Addicott, 1976; Armentrout, 1980; Hickman and Nesbitt, 1980; Dale et al., 1989; Syvitski et al., 1989; Aitken, 1990; Aitken and Bell, 1997; Carney et al., 1999). The in-faunal communities also determine the preservation potential of finely laminated structures such as cyclopels and cyclopsams, which are better preserved in high sedimentation rate areas where biological productivity is low (Gilbert, 1984; Aitken et al, 1988; Eyles et al., 1992; Syvitski et al., 1996; Cai et al., 1997; Ashley and Smith, 2000; O Cofaigh and Dowdeswell, 2001). Open water fjord systems occur in the distal reaches of glacial fjords and during the paraglacial and deglacial phases of fjord evolution. Although these are important systems, they are dealt with here cursorily because the emphasis is on glacial systems. Deep water estuarine processes dominate the system. Evidence for glacial action is slight and in temperate to sub-polar regimes sedimentation is predominantly hemipelagic having a fluvial source and a high organic content. In polar and some sub-polar regimes, sea ice, aeolian and biogenic processes are important. Once abandoned by glaciers, sea water circulation patterns change dramatically, and if fjord basins are deep relative to the sill height and outside water does not have the density to penetrate over the sill and descend into the basin, anoxia occurs forming chemically reduced, dark mud (e.g. Syvitski et al., 1987). Often the only evidence of cryogenic processes is from sea ice, and that is mainly in polar regimes. It is under these conditions that most systems experience little deposition; condensed sections are produced because fjords have very low sediment accumulation rates, even if they do not go anoxic (e.g. Pickerill, 1993). Under such conditions, diagenetic processes, particularly in the deeper water systems, can lead to characteristic chemistries and unique mineral formation, such as ikaite, which is thought to form in very cold water systems (Buchardt et al., 2001) and preserved as what have been defined as 'glendonite crystals' in the stratigraphic record (e.g. Domack et al., 1993a). If the fjords experience some riverine input, turnover and productivity at least in the upper waters, thick varved sediments may accumulate during full interglacial periods comprising diatomaceous spring-summer laminae and terrigenous winter laminae, such as has been recently recovered in Saanich Inlet, British Columbia (Blais-Stevens et al., 2001). The walls of fjords are commonly very steep and often have hanging valleys left where tributary glaciers entered as a trunk glacier. Walls are not always straight and they often have bends or bays in which sediment can accumulate in the form of pocket beaches and tidal flats. The steep walls are most active sedimentologically during retreat of a glacier where glacial sediment had been ice-dammed along the margin of the glacier and then it loses its support during glacial downwasting and eventual terminus retreat. Immediately after a terminus retreats the highly water-charged sidewall sediment fails rapidly and is redeposited to the fjord floor by rock fall and mass flowage (Cowan and Powell, 1991a). The failed sediment includes a mix of rockfall and supraglacial ablation debris, till, glacifluvial and glacilacustrine deposits (see Chapter 7). Gilbert-type deltas. In polar climates it is the talus cones that form and develop no further due to a lack of running water and sea ice protection from waves. If fjords are wide, oriented favourably to dominant wind directions and are long enough for sufficient fetch, then wave action on shorelines may develop beaches. They are often gravelly due to reworking of glacial deposits. These pocket beaches tend to form in small coastline embayments often associated with tributary valleys, which are the main sediment source. Close to glaciers, calving waves may also be important by eroding the beach face or carrying icebergs well above high tide (Syvitski and Shaw, 1995). In the intertidal zone icebergs can wallow and scour beaches. (e.g. Reimnitz and Kempema, 1982; Dionne, 1983, 1988, 1998; Hansom, 1983; Powell and Molnia, 1989). In the longer term, these systems are very much influenced by glacial isostatic effects. Perhaps obviously, it is the rebound after glaciation that is critical for preservation of the systems, as those that are formed prior to and during advances are eroded. Rebound changes base level and alters facies types and geometries and ultimately can bring these systems into zones of erosion as they are raised to within wave-base or even above sea level. During the last stage of the fjord deglacial phase the head of a fjord is the locus of most of the terrestrial sediment being supplied. This situation lasts through the paraglacial phase, and probably the fjord valley phase until the next glacial advance phase. In the initial stages grounding-line systems may accumulate as the glacier is retreating from the sea. In temperate and sub-polar regimes the grounding-line systems are likely to be dominated by grounding-line fans, which eventually aggrade to sea level until the fan apex becomes intertidal (Powell, 1990). Over time the landward end of the fan apex aggrades above sea level to form a delta plain and a new fan delta system becomes established (Fig. 13.13). During the intertidal stage many redepositional episodes occur, mainly as turbidity currents as the outwash stream channels migrate readily, often over tidal cycles as they are repeatedly raised from the intertidal portion of the delta plain at high tide and then lowered during ebb tides to erode the plain and any new sediment just accumulated. Figure 13.13 Sketches of the modes of formation of grounding-line fans during low, moderate and high discharges. If a terminus remains at one location for sufficient time (a longer time for lower discharges) then these fans grow to sea level where the fan apex becomes intertidal to eventually becomes a delta plain, having sea level as its base level. (After Powell, 1990). As a delta becomes established it progrades and the delta plain expands under a braided stream system due to cyclic discharge and high sediment loads. Even as the delta plain expands, tides appear to influence re-sedimentation from the plain, at least in macrotidal areas. A process of tidal draw-down has been documented where during neap tides sediment may get stored on the outer reaches of a delta plain and then that sediment is redeposited during spring tidal periods when sea level falls below the lip of the delta to dramatically change local base level creating incision on the delta plain (Smith et al., 1990; Phillips et al., 1991). Delta fronts are sites of rapid sediment accumulation, which drive the progradation but also are areas of large mass failures and slides, and sediment by-pass in the form of turbidity currents (e.g. Prior et al., 1981, 1987; Syvitski and Farrow, 1983; Prior and Bornhold, 1988, 1989; Syvitski, 1989, 1993; Carlson et al, 1989, 1992, 1999; Fig. 13.14). Re-sedimentation appears to start in upper delta front areas from numerous small-scale gullies; eventually flows coalesce downslope and become channelized in turbidity current channels. These channels can run out along the fjord floor for tens of kilometres and some may end in small submarine fans. There are also good examples of these systems in uplifted Quaternary deposits (e.g. Plink-Bjorklund and Ronnert, 1999). Figure 13.14 Schematic diagram of the Kitimat delta, British Columbia, Canada. The diverse mass flow processes and surface morphology are based upon high-resolution side-scan sonar data. (After Prior et al., 1983). In contrast, full polar deltas are sites of little activity where small ephemeral streams may be active for a few months over summer but carry low sediment loads (Chinn, 1993; Doran et al., 2002). Delta discharges are ephemeral and the delta plains are protected from wave action by extensive sea ice cover (Powell, 1981b; Gilbert, 1984); open coastal systems on the other hand may be more active (e.g. Hill et al., 2001). Major deposits are biogenic and similar to those described above (see Open Marine Systems). In a similar way to sidewall systems, these fjord head systems are significantly influenced by isostatic rebound and may eventually be raised above sea level with concomitant changes in facies patterns and geometries, erosion and lag surfaces produced. The lowering of base level during rebound decreases the accommodation space for sediment on the delta plain creating stream incision and an increase in progradation of the delta. Fjord valley systems are created after deglaciation following the glacial and paraglacial fjord phases, when a fjord becomes filled with sediment to above sea level (Fig. 13.15). This stage can occur in temperate, sub-polar and polar settings and once reached, terrestrial glacial and non-glacial sedimentary systems are established. Figure 13.15 The cold desert environment of a polar fjord valley, McMurdo Sound Dry Valley system, southern Victoria Land, East Antarctica. The aerial view looks up Taylor Valley from its mouth in the sea-ice-covered Explorer's Cove on the Ross Sea coast. Drilling by the Dry Valley Drilling Project in the 1970s on the delta (foreground) and on the ridge between it and the first piedmont glacier to the right (Canada Glacier), showed more than 300 m of mainly glacimarine sediment filling a fjord dating back to at least Miocene time (McKelvey, 1981; Powell, 1981b). 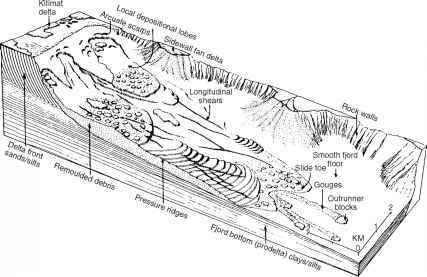 • subglacial fluvial sediment transport (sheet, conduit and open-channel flow). • deltas (Syvitski and Daughny, 1992). However, many of these individual glacimarine sediment models remain in their infancy and still require further development and testing. Furthermore, many dispersal processes are dependent on fjord circulation and thus tidal and estuarine circulation models must be considered. Partially independent parameters, biological productivity and ecosystem variability largely influence the sedimentary record preserved in the landsystems and provide important dating material. Thus factors such as the rates of community establishment and rates of bioturbation should also be quantified. Figure 13.16 Hypothetical cross-section showing glacimarine allostratigraphic units deposited during the retreat of a temperate glacier with a tidewater terminus. During the time when the terminus was in sections A and C it was retreating rapidly by calving in deep water, and sediment (mainly bergstone mud) was deposited as a sheet above till. 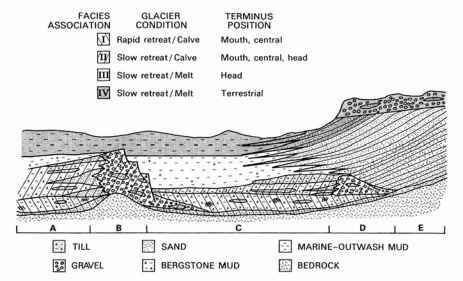 During the time the terminus was in section B, calving continued but recession was slowed by a channel constriction; a morainal bank was formed, beyond which mass flows interfingered with bergstone mud. When the terminus was in section D at the fjord head, calving and recession slowed and a morainal bank formed initially; eventually calving was superseded by surface melting and a grounding-line fan developed into a delta, with bergstone mud accumulating distally. Lastly, when the terminus was fully terrestrial in section E, the outwash delta prograded over previously deposited sediment with paraglacial marine outwash mud accumulating distally. (After Powell, 1981a).